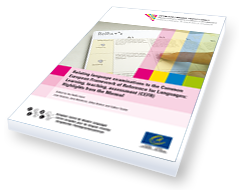 In recent years the Council of Europe‘s Common European Framework of Reference for Languages (CEFR) has become a powerful instrument for shaping language education policies. The growing acceptance and use of the Common Reference Levels of language proficiency presented in the CEFR has created a situation in which, all over Europe, public bodies, examination institutes, language schools and university departments concerned with the teaching and testing of languages seek to relate their curricula and examinations to the Common Reference Levels. 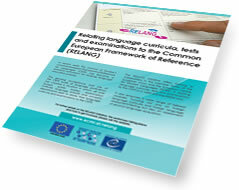 The RELANG initiative offers training to educational authorities in the Member States of the European Union and the European Centre for Modern Languages in relating language examinations to the levels of proficiency defined in the Common European Framework of Reference for Languages in a valid and equitable way. The long-term objective will be that foreign language curricula reflect the CEFR model of language use and assessment materials are related to CEFR levels of language proficiency; language examinations ensure that learners are assessed in valid and equitable ways and that learners’ test performances are expressed in terms of CEFR levels that are valid, understood and widely accepted. the application of these principles, practical tips and exercises. Support materials will be developed and adapted to the specific needs of the interested member states; The screening of existing tests and examinations on their links to the CEFR, will also be on offer. Post-workshop follow-up and support to countries where activities have taken place to further enhance impact. On 12-13 March 2019, the ECML Contact Point Denmark - The Danish National Centre for Foreign Languages - invited ECML experts in Copenhagen to provide a training and consultancy on Relating foreign language curricula to Common European Framework of Reference (RELANG). The aim of the training and consultancy activity using RELANG tools was to improve the alignment of Danish tests and examinations to the Common European Framework of Reference (CEFR) and Companion Volume. The focus was in particular on tests and examinations in upper secondary schools. The participants (language teachers at university and university college, primary, secondary and upper secondary school and language consultants at the Ministry of Education) were inspired and received inspiration and clear directions on how to relate existing Danish tests and examinations to CEFR levels and descriptors. Participants gained a deeper knowledge of CEFR descriptors and received practical guidance on how to revise learning outcomes and link them to relevant CEFR levels. Participants worked on all linking phases: familiarization, specification, standardization and benchmarking. The participants were also asked to develop valid exams items for oral and written production related to the CEFR and Companion Volume. In addition, external assessment materials provided by the Danish participants and ECML experts were discussed during the training and the participants tried to link them to the CEFR levels. Some of the RELANG materials will be adapted/modified to fit a particular institutional context. ECML project website: RELANG – EU-ECML cooperation agreement 2018-2019 "Innovative methodologies and assessment in language learning"
Local coordinators from 16 countries (Albania, Austria, Belgium, Cyprus, Denmark, Estonia, Greece, Iceland, Ireland, Lithuania, Malta, Norway, Portugal, Romania, Slovenia and Spain) met with project teams at the ECML on 30-31 October to advance preparations for national workshops to be hosted on the themes of Relating language curricula, tests and examinations to the Common European Framework of Reference (RELANG) and Supporting Multilingual Classrooms. The series of events targeting practitioners, multipliers and administrators at national level will take place between January and August 2019. The RELANG and Supporting Multilingual Classrooms initiatives, providing training to Member States of the European Union and the European Centre for Modern Languages, are organised through a joint cooperation action with the European Commission - first launched in 2013. www.ecml.at/ec-cooperation. The action which is based on two key language education concerns within the targeted states will offer training and consultancy over the next year to around 500 language professionals within national systems. ECML training and consultancy offers for 2019 – Apply now! Are you looking for input for an in-service training to develop the professional skills of language educators? Or are you in need of consultancy to advance local, regional or national reform processes and to meet international standards? Then take a closer look at what the ECML has on offer. Requests for a training and consultancy activity must be submitted until 4 November 2018 via the national ECML representative in the Governing Board. Educational professionals interested in organising a particular activity should therefore contact their national representative. In September 2018, the European Centre for Modern Languages of the Council of Europe and the European Commission, Directorate-General for Education and Culture, plan to launch another round of activity within the joint action on Innovative methodologies and assessment in language learning. The action includes 2 initiatives: RELANG and Supporting Multilingual Classrooms. RELANG focuses on relating foreign/second language curricula, tests and examinations to the Common European Framework of Reference for Languages (CEFR), and Supporting Multilingual Classrooms focuses on the linguistic integration of migrant learners in schools across Europe. The activities are scheduled to take place from 21 September 2018 to 20 September 2019, each initiative offering up to 9 national workshops during this period. The call is open to current European Union member states and the additional member states of the ECML until 27 June 2018. For further information, please contact Adelina Rosca (adelina.rosca@ecml.at), the ECML-EC cooperation agreement coordinator. The ECML colloquium "Ensuring quality in language testing and assessment" (Graz, Austria, 7 December 2016) was a great success. Thank you to everyone who contributed and participated - onsite and online! The colloquium on “Ensuring quality in language testing and assessment: the contribution of the Common European Framework of Reference (CEFR)“ is organised by the European Centre for Modern Languages of the Council of Europe in cooperation with the European Commission. The event will trace the progress that has been made since the publication of the Manual for Relating Language Examinations to the CEFR, offer a platform for an exchange of experiences from different European contexts and propose ways to address the ongoing challenges in aligning language curricula and examinations to the Framework. How do I know whether a test is at the CEFR level it claims to be at? Can an exam that tests linguistic competence (language use) be linked to the CEFR? How do we make sure that our pass/fail decisions are related to the CEFR? Can we test at more than one CEFR level in one test? Can we link our tests to the CEFR levels even though we do not have statistics on student performance on our tests, apart from total scores? Can tests of different skills be summarized at one CEFR level? The colloquium should be of particular interest to those who are responsible for or engaged in developing foreign language curricula and/or examinations, notably those who work in national curriculum or examination centres. For further information on the event, including the Colloquium programme, please visit the colloquium webpage. WEBCAST – starting on Wednesday, 7 December at 09:30. The quality assurance matrix for CEFR use is an innovative project comparing CEFR implementation in different contexts and employing a quality assurance approach. The project will promote effective language learning by supporting teachers and other language education professionals in their use of the CEFR. It will suggest clear, coherent, and relevant procedures to facilitate planning, teaching and assessment and it will produce a practical tool, in the form of a template, which will serve for self-assessment before or during CEFR implementation and self- or external evaluation after the implementation. As the project moves from a rigorous empirically based and experience informed perspective, we are looking for a fellow to support us in the project work. Before and after the central workshop, participants will conduct semi-structured interviews in their respective countries and complete a form including both the outcomes of the interviews and their own reactions and thoughts about achievements, challenges and opportunities. The data collected will be an important source to inform the matrix which will be the final product of the project. The fellow will participate in the data analysis phase of the project under the supervision of the project coordinator and of the other team members. He/she will be subsequently involved in assisting the team in the development of the matrix. The ideal candidate will be a young individual with an MA or above in a relevant field. He/she will either be a citizen or a resident of one of the ECML member states. Assisting in the preparation of the network meeting of the project which will take place in May 2017. The fellowship is a unique opportunity to work in the highly stimulating, multicultural and multilingual international environment of the European Centre for Modern Languages in Graz, which is a partial agreement of the Council of Europe. The knowledge and expertise resulting from this fellowship will be a considerable asset for future endeavours both in academia and in the professional world. The fellowship will last three months February, March and April 2017 so that the fellow can assist in preparing the subsequent network meeting in May. The fellow will receive a total allowance of €3,450 EUR covering the 3 month duration of the fellowship. Travel costs will not be covered. Applicants from ECML member states or currently studying in ECML member states should send a letter of motivation as well as their CV in English or French to: margit.huber@ecml.at. The publication offers an introduction to linking examinations to the Common European Framework of Reference for Languages in a valid way. The highlights are targeted at producers of language examinations, who are less familiar with psychometric procedures and who are not (yet) assessment experts.